Technology is amazing, and it’s not just for the younger generation to enjoy! Homebound seniors, in particular, can benefit from the social connections available through technology to allow them to remain actively involved in the world around them. Studies have shown that remaining social benefits our health in a plethora of ways: from reducing our risk of disability, to protecting the brain from mental decline, and even lowering pain and our likelihood of becoming depressed. Social Media: Older adults age 74 and above are the fastest growing demographic among social networks, according to the Pew Research Center’s Internet & American Life Project. Social media offers older adults and their families an easy way to check in with each other, allowing for more frequent conversations between the generations and enhancing peace of mind for everyone. Wii: All ages are enjoying Wii games, and seniors are no exception! 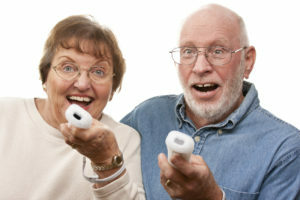 In fact, seniors who may typically be reluctant to get involved in activities are finding a new level of enjoyment and chance to engage with others through playing Wii games. Online Senior Dating Services: Older adults are the largest growing group of subscribers with online dating services, with one company reporting a full 89% growth rate over the last five years of seniors utilizing their service. Senior dating sites offer older adults a greater opportunity to find others with similar interests. Skype: Skype is an amazing piece of technology for older adults, with its online video conversation capabilities for loved ones living at a distance. It’s also a wonderful way for family members to include a homebound senior in birthday parties and other group gatherings. Home Care: For older adults in Santa Rosa who struggle with finding reliable transportation, or who are reluctant to leave the house, homecare can help. A caregiver can provide encouragement for seniors to attend events and activities, as well as provide accompaniment and transportation. Caregivers can also coordinate visits with friends and family, and participate in playing cards or other games with the senior. Since technology is sometimes a bit intimidating for older adults, home care agencies, such as Hired Hands Homecare Santa Rosa, can help seniors become familiar and comfortable with options that may be of interest to them, and help keep isolation at bay. Besides providing homecare in Santa Rosa, we also service the surrounding counties. Check out our service area map and contact us at 866-940-4343 to find out how we can help enhance the quality of life of your senior loved ones by enhancing their socialization!